This German Shepherd nicknamed Lucho (Sold) sold and went to a new family. 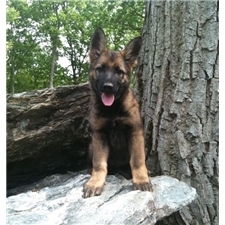 At Garden Grove Farm we've been raising German Shepherds for over 16 years. We've had puppies go to the police department, search and rescue, and a handicap assistant who sensed seizures in his handler, though most of them simply become happy, loved members of their new families. The keystone of our breeding success is the amount of time and socialization our puppies are given. We have 10 children so there's always a person to spend time with. We have a beautiful 107 acre farm in the foothills of the Appalachian Mountains so the puppies are raised with the freedom to explore, they have interaction with other animals, and they grow familiar to the noise of farming machinery. Another benefit of the farm is that we are able to raise a lot of the food that our dogs and puppies consume: scraps and bones from beef and pork, meat from rabbits and chickens, farm fresh eggs, and vegetables from our gardens. The dam of this litter has champion bloodlines and comes from working lines. She is a beautiful dark bicolor and is an excellent mother. 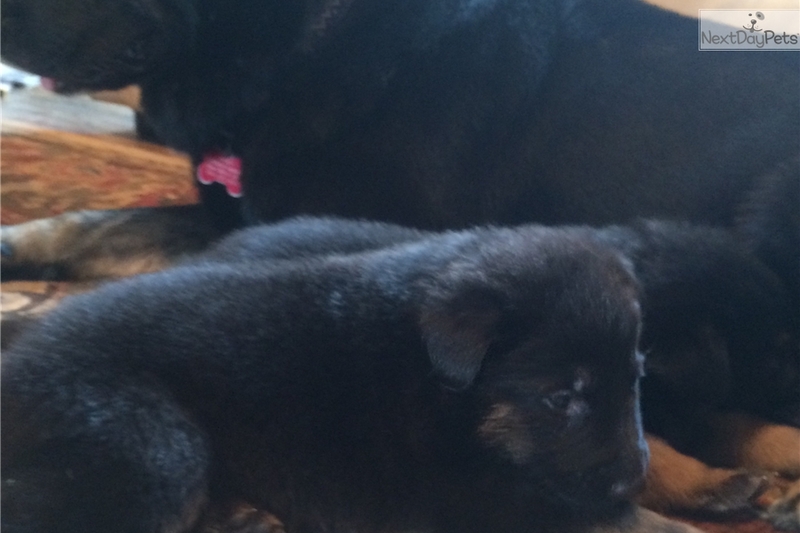 She also brings strong muscular confirmation to the litters and weighs in near 100 pounds. The sire is a large built sable from European lines and also has championships in his lineage. He has produced many beautiful, healthy pups and has an excellent temperament. We always love to meet the new owners of our puppies and encourage everyone to come to the farm and meet the puppy's parents (and us!). We recognize its not always possible to pick your puppy up yourself so we have built a resource of couriers who will pick your puppy up at my home and deliver him to your door. We also provide airport shipping across the U.S.